Heatsinks can be a major obstacle to building many of the Pass DIY projects. I built a version of the A75 using copper heat exchangers that allowed for water cooling. I sourced these from Melcor, and they measure 2.00" x 6.00" x .5". I drilled them to accommodate TO-3 transistors. Water circulates through an interior channel that terminates with two .25" x 1.00" copper tubes. Compression fittings allowed me to connect these to readily available .25" plastic tubing used for refrigerator ice makers. I used a trickle of cold water tapped from a household cold supply pipe, which worked great, but the ambitious can make a closed loop system using a Little Giant pump and a section of baseboard heat. The advantages? You can pull lots of heat from your transistor using this system. I used double dye MOSFETs made by Magnatec. (Double dye means two MOSFETs in one TO-3). The liquid cooling allowed me to run them hard without reliability issues. 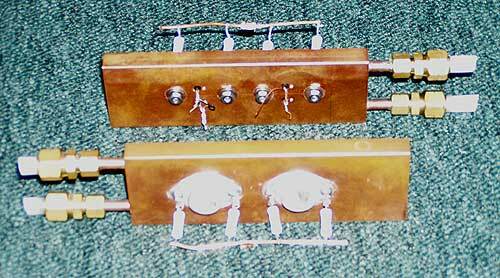 In fact, I got 45 watts Class A from just one pair per channel! Using just one pair of MOSFETs per channel allows for a compact design with minimal wiring, stray capacitance, etc. Neat!